How do you defeat a man who stands 9-feet, 9-inches tall? What if this man had a bronze helmet on his head and wore a coat of scale armor of bronze weighing 125-pounds; on his legs he wears bronze greaves, and a bronze javelin is slung on his back. His spear shaft is like a weaver’s rod, and its iron point weighs 15-pounds. I’ve just described Goliath from 1 Samuel 17. So how does David, a boy shepherd, defeat this huge man with one blow? 3-times NY Bestselling author Tim Ferriss said that being effective is doing the right things. And being efficient is doing things right. 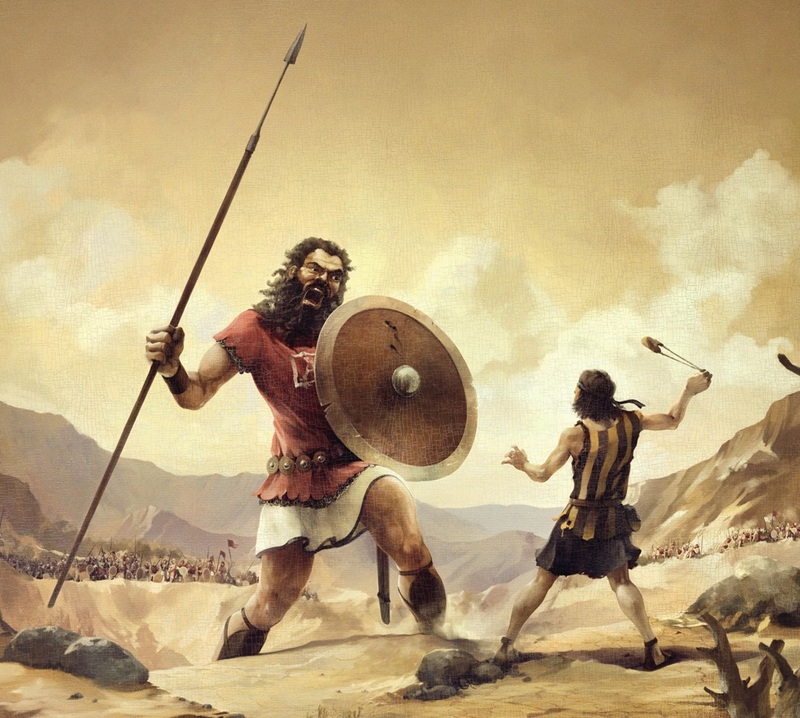 Unmatched physically, and standing up to Goliath, David was “effective” by using a slingshot. And being an expert marksman (efficient) with the weapon, made Goliath look like he brought a knife to a gun fight! So what do baseball batting tips and Wilin Rosario from the Colorado Rockies have to do with the story of David & Goliath? Wilin (pronounced Wil-een) “Baby Bull” Rosario is a small hitter compared to behemoths like Albert Pujols (6’3″, 230-pounds), Giancarlo Stanton (6’6″, 240-pounds), and Miguel Cabrera (6’4″, 255-pounds). Rosario stands 5-foot, 11-inches, and weighs in at 220-pounds, according to FanGraphs.com. Sure, 220-pounds isn’t tiny by any stretch. But 5-foot, 11-inches sure is, especially by today’s standards…hence the nickname “Baby Bull”. Wilin Rosario had 426 plate appearances to Miguel Cabrera’s 697. Rosario hit a home-run every 15.2 plate appearances, while Miggy hit one every 15.9. Miggy’s 16 extra dingers may have brought down his average True Distance and Ball Exit Speed numbers. By the way, 2012 was when Miguel Cabrera won baseball’s heralded Triple Crown. But surprisingly, on paper, Wilin Rosario shouldn’t even be in the same room with Miguel Cabrera! So what is empowering a small slugger like Rosario to compete with the Goliaths of baseball? Baseball Batting Tips #1: Stop Standing Still! One thing Wilin Rosario does really well is he “un-weights” the bat. Slight barrel tilt toward the pitcher just before the fall. CLICK HERE to see the results of a Zepp swing experiment when I tested a longer stride against a wide no-stride approach. Watch how Wilin Rosario: 1) Shows his numbers to the pitcher, 2) Hides his hands from the pitcher, and 3) Creates a downhill shoulder angle before front foot hits the ground. Spinal engine mechanics are key! I call this the Catapult Loading System. CLICK HERE to see the results of another Zepp swing experiment when I tested showing the numbers versus NOT showing the numbers. So how does a small slugger compete with a big one? Being effective is strictly following human movement rules proven by science. And then being efficient within those guidelines. Just like David was effective using the sling shot against a foe twice his size. And, only needed one shot (efficient) to take the BIG guy down. Baseball Hitting Drills For Youth: DO NOT Be "That Guy"
I can’t figure out how to get to the free video you mentioned at the end of the this video. Marshall, you’ve seen it before I think. Did you want me to send it to your email? What website and great information. Please let me know if you’ve answered this elsewhere, but I’m trying to figure out the role the hands, showing the numbers and elbow play together. I have a batter (my son) that when I ask to show his numbers his hands remain in the same place, but when I ask him to move the elbow back and hide his hands this causes his numbers to show. Do all three movements rely on each other or are they separate movements that have different effects on the swing? If this is taught in the CLS online program, please let me know and I’ll stop being cheap and invest in the program. My son is only 5, but super thin and lacks power, I know he’s only 5 and am very aware as he gets older he will get a little stronger, but I am trying to possibly get him to get a bit more pop on his contact. Thank you.